Although RV drivers spend a relatively small amount of time trailer backing this maneuver results in a large number of mishaps. Backing is basic, but it isn't simple when you're maneuvering a large or jointed vehicle. It takes patience, good judgment, and a certain amount of skill to back without damaging your RV. Get out and look (GOAL) before beginning to back. You need to see what you're backing up to. Check for obstacles that you might not otherwise be able to see. Check all sides of your RV and underneath before beginning to back. Use a spotter to help guide you back and to stop you before getting into any trouble. Be sure to agree on hand signals before starting, so you'll be able to recognize the signals. 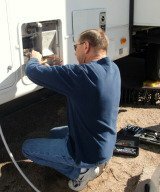 Be aware of any blind spots on your tow vehicle or motor-home. Position your spotter where you can see them and the spotter has a clear view of the vehicle's path. Use your four-way flashers to alert others that you will be backing. A back-up camera takes the mystery out of backing and can be used for viewing a towed vehicle and rear traffic while driving. Most importantly; take your time when backing and trailer maneuvering. It's more embarrassing to run into something and damage your rig than to take your time and do it right. Back and turn toward the driver's side. This is known as "jacking" and "chasing". "Jacking" is changing the direction of the trailer by steering in the opposite direction. To turn the trailer to the right turn the steering wheel to the left. "Chasing" is steering your tow vehicle just enough to follow the path of the trailer. Watch your trailer in your left mirror. Watch your rear wheels and if you miss your turning point, pull up and start over. Never jack more that a 90 degree angle. You will Jack-knife your trailer! You should get out and look every few feet and check for problems. If everything looks good you proceed and if not pull forward and start over. Don't Rush, plan your maneuver, check your mirrors and your wheels, use a spotter, back slowly, change direction with your steering, and pull up and start over if necessary. A backup camera can take the mystery out of trailer backing!